From Sensor to Any Cloud in < 1 Minute — Plug&Play. 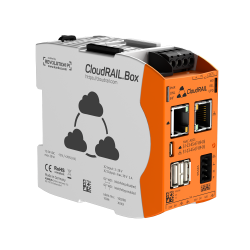 The CloudRail.Box allows you to connect industrial sensors and actuators (IO-Link) directly with your Cloud Platform. No industry buses, no edge gateways, no domain knowledge about the OT — plug-in a sensor, select the cloud, done! 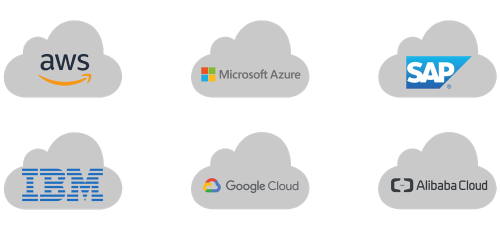 The CloudRail.Box currently supports Amazon Web Services (AWS), Microsoft Azure, IBM Cloud, Google Cloud, SAP and the Alibaba Cloud (always the IoT hub). Besides the actual data transmission, special functionalities like device shadow are included. We’ll continuously add new cloud providers once they become relevant. The CloudRail.Box automatically works with IO-Modules (e.g. IO-Link Masters) of several vendors. 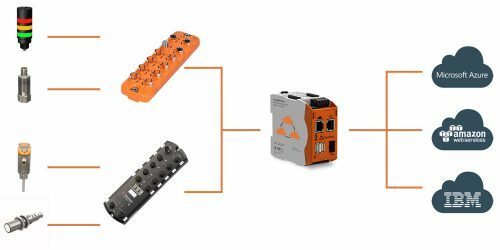 Just plug in a module and you will instantly see the additional ports and connected sensors — no configuration required. The CloudRail.Box comes with a sophisticated device management solution. It’s your central place to manage all IoT-enabled devices, even in multi-provider setups. Firmware updates with new functionality or security patches can be rolled out from here as well. Use any sensor or actuator in your IoT project. Fast results for new IIoT projects. No external consulting required — your IT team can handle it. The CloudRail.Box works with the following IO-Modules and Sensors. We closely work with the leading vendors in this area to continuously increase the list of compatible devices. All IO-Link masters of the DataLine edition. Connected to the CloudRail.Box via the IoT-port (Y-Path, parallel connection to a PLC possible). Connected to the CloudRail.Box via the fieldbus port (no parallel connection to a PLC). The CloudRail.Box works with sensors and actuators with an IO-Link interface. Almost all professional sensors for industrial applications already support IO-Link. In total, the CloudRail.Box is compatible with over 12000 sensors and actuators. The CloudRail.Box has been specifically designed for industrial environments. The hardware is Made in Germany by the experts of Kunbus. More questions? Read our FAQs or contact us at support@cloudrail.com. The CloudRail pricing is always a combination of the hardware price for the CloudRail.Box and a subscription based on the number of sensors or actuators which are connected to the cloud via any CloudRail.Box. Packages are always per account and can be shared across multiple CloudRail.Box devices. * for the first 12 month. 490€ per year afterwards.